First contact is such a perilous time. Thanks to all my Patrons for your support in January! You continue to keep me alive and updating with comics and bonus material. Speaking of which; a bit of Patreon bonus about newFriend here, and an “original” MI wallpaper here. Today’s bonus art: some uncorrected colors from the previous page, since I had the window open and I kinda liked it. You can see the parts that needed correcting pretty well there, haha. What expressive body language NewFriend has! So it’s an intelligent Martian life form that learned English through the LEVi? That thing must be smart as hell to learn that fast. Also “thrip” crab is cute. Haha, you’ll like what that “however” is attached to. Related to a “By the way…”? I almost missed that little thripping shrimp-thing on NewFriend’s shoulder. I wonder how many of the chapter epigraphs are in LEvi. Those aren’t his arms, those are his legs. His arms are the massive trunks supporting him. If you look closely at panel 5 on the last page, you can see his teeny-tiny legs are behind his gorilla arms. I suppose it all depends on if you qualify them by their use or their relative position. Martians are kind to small animals. That’s got to be a good sign, right? Also, the more I see of him, the more awesome Martian looks. Gravity is what, a third of Earth? They have an easier time becoming big. I really like what I’m seeing from Mars Legman (leg-min). Design aside, the fact that it seems to be sporting a hair(?) decoration is encouraging. A shared sense for physical aesthetics is a great way to bridge a potential species gap, in my opinion. Also, it looks to be gently probing him for emotional feedback and showing concern for his well-being. Indicator of a highly social species? Everybody knows stressed meat tastes bad. I think thighfriend was eaten by newfriend and that’s why depressed dude is bleeding. I love Mike’s nose tho. It’s beauty. Hahaha Mike is not impressed by your motivational quote. Not impressed. I feel like your love for little reptiles and amphibians shines through in the facial structure and simultaneously intense/blank gaze of our new friend. I’m curious as to how the creature is speaking to Michael – it isn’t opening it’s mouth at all. And I’m curious about the status of Thighfriend. Watch a parrot talk. Their mouths don’t move much at all. Yeah, my preference is not to have the mouths open all the time in every panel, I think it’s pretty obvious when people are talking in general and also Mike is sort of a mumbler? Makes less sense to have him be like :[___] in every panel, unlike in animation where things need to be very literally acted out. But yeah, for newFriend I can see how that’d be confusing since it’s not a person and we don’t know how they work yet… there will be time to look inside its mouth in the future tho haha. >_> Am I supposed to worry about the guarantee that we will see this alien’s mouth open? As for Vert’s comment, while from what I’ve gather the mouth of a talking bird does move noticeably, it is true that birds don’t talk with the same body parts humans do. And the nature of the beak means they won’t have the versatile movement you see in human lips. Our alien friend here seems to have a similar rigid facial structure, so perhaps he speaks with something more comparable to a parrot’s syrinx than a human larynx. Maybe it’s the little shoulder crab-shrimpy buddy that is actually speaking??? Or translating like a Babel Fish? Man, are we going to have a Wikus from District 9 situation here? Is Mike slowly turning into an alien? I just realized these two are also nose-friends! I also look forward to a detailed explanation of Martian-Friend’s anatomy. It’s very… alien. Thrip-plushies when, indeed. I would throw my money away for a cute Martian crab to snuggle. I for one would LOVE a thighplush! Dinobutt is going to eat cricket friend, I can feel it. Welp. 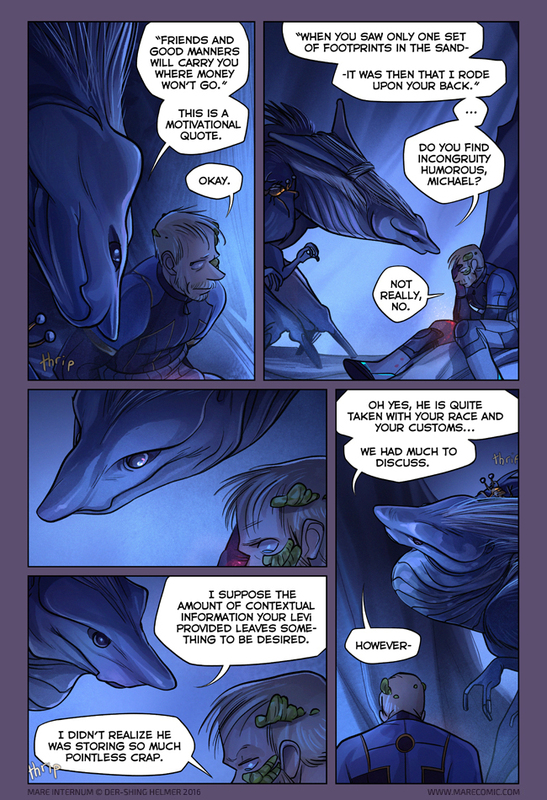 I found this comic last night, and read the entirety of it this morning, expecting to be slightly less confused and have slightly more context when I once again reached this page. I can safely say that, no, I am absolutely just as, if not more, completely and utterly befuddled and lost about what is happening, both on this page and in this comic in general. Which I feel is the goal? Maybe? Also thighfriend has grown on me (heh) now that I’m slightly more prepared for the body horror (which is normally one of my least fave things in the world, along with spiders…I must be a masochist, because I’m really looking forward to continuing this comic live). Also the comments section of MI is amazing. Haha XD Yeah, I’d like you to feel confused and impelled forwards, but it’ll all make sense by the end. TBH we haven’t reached the thesis/ point of the comic yet but it’ll be obvious once we get there. In any case, glad you’re enjoying it! And yeah, the comments are the best, I get a huge kick out of reading the confusion and puns every update. Eh, “he” is a default pronoun in Western culture. We tend to use “he” or “it” until it is made clear to be otherwise. BUT it is true that there are so many interesting methods of reproduction possible in biology. Yeah, I’ve definitely had a female vibe coming off newFriend from the beginning. I remember having an idea like this a while ago, an underground parasitic fungal paradise where the fungus that grew on a person served as weapons and such with razor disk capped fungus and there’s this one species IRL that builds up pressure behind its spore ball and launches it like a bullet. Pumped to see what else mars has. Oh gosh, I love this new friend!! Now we know what Levi’s been up to — making friends with the locals! New friend is so cute! levi is a consciousness connecting machine that mike controlled and lost by accident… alien parasite connected to levi consciousness and learned mike brain info while taking over levi body… ish? You have to quote things correctly, NewFriend, if you want Michael to like you. If he doesn’t find incongruity humorous, one can only imagine his thoughts vis-à-vis inaccuracy. Hair AND a Bony Crest! You’ve gone off the deep end now Der. I really don’t think there is any saving you. Go big or go home, buddy! I’m loving all the different design vibes I’m getting off of newFriend. The head alone reminds me of a dogfish skull crossed with an eagle (especially with the very avian body language with the neck), the ornamental crest of a dynastid beetle/leafhopper/brontothere, and maybe even a plethodontid salamander, going by the contour of the mouth. I can’t say as I really follow what is going on here, but then I suspect I’m not supposed to… or that things are getting exceedingly metaphorical / hallucinatory. I love this creature already.